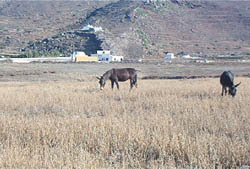 Horses, donkeys and mainly mules were the only means of transportation in Santorini up to 1960's. They are part of the native charm and a symbol of Santorini. Today we can find them mainly at Gialos, the old port of Fira, where during the summer they carry tourists up and down the endless steep steps which connect Fira town to the small port below. They are extremely adept at negotiating the steps, but be aware that they do have a tendency to go kind of fast!